Security hedges, thorns, burglars and barriers. Posted: Sun Feb 12, 2012 7:46 pm Post subject: Security hedges, thorns, burglars and barriers. We all know the most common beneficial elements that a carefully selected hedge can bring to a garden. With shelter from winds and privacy from prying eyes being the most obvious ones. They also bring considerable interest to gardens with their variety in leaf colour, sequence of flower, fragrance, berry production and autumn colouration. Hedges can be used to define boundaries and wrap around both sides of an entrance to unobtrusively suggest in which direction a visitor is welcome to walk. Sometimes however, a physically unwelcoming barrier is necessary. This is where the security hedge comes in. Of course farmers have been using unwelcoming barriers with good results for many years. Think about how many cattle and sheep have been contained within fields surrounded by no more than a dense hawthorn or blackthorn hedge. All right, there are occasional breaches of these thorny barriers, but for the most part they are pretty impenetrable. Now taking our lead from the farmer, the gardener can turn thorny hedging plants to their advantage, using them to help contain or repel as required. It's sad to say but the home gardener will on many occasions be more concerned about keeping human intruders out rather than those of a bovine or ovine persuasion. According to the latest Eircom Phonewatch survey the nationwide incidences of burglaries has increased by 4.12% in the twelve months between July 2010 and June 2011. They found that burglaries are regularly taking place in daylight, not only under the cover darkness, as we would assume, so sensor lighting is rendered ineffective in such situations. Without a doubt a good watchdog and a locked gate can be effective at deterring burglars, but so can a security hedge combined with a little vigilance. Thorns like these are a pain to burglars, photo / picture / image. To help keep intruders out, you will need a thick, tricky to penetrate, hedge with strong thorns. It should be extremely hard to walk through, hide in, or climb over, greatly slowing entry into the site and able to rip clothing if tangled with. Basically you will want burglars or nuisance makers to avoid it and move on to a property that is a lot less hassle. This evergreen hedging plant with miniature holly-like leaves sports orange spring flowers followed by dark blue fruit. Spaced at 45cm (1.5ft) it creates an evergreen hedge 6 to 8ft tall at a moderate growth rate, adding approximately 1ft per year. It is ideal as a security hedge in urban/suburban areas. Also known as whitethorn or quickthorn this deciduous variety should be spaced at 30cm (1ft) intervals to allow it to reach 6 to 8ft tall quickly. Being native to Ireland and the UK it's got everything we require in a hedging plant including wind resistance and tolerance of a wide range of soils. Ideal for use as a security hedge in countryside areas. Top tip: Chicken wire can be woven amongst the plants when young to provide an instant barrier, and left in position as the plants establish. More well known here in Ireland as furze, this evergreen creates an informal hedge up to 6ft tall if spaced at 60cm (2ft). It boasts severe spines and an ability to cope with windy locations, all topped off with sweet scented pea-sized yellow flowers from March to May. Similar to hawthorn in its rustic look it appears right at home in wild or countryside areas. 'Himalayan Giant' although not suitable for smaller gardens, is ideal for planting along a long fence or rear wall as a burglar-proof screen. It's a brave buck that would face its fifteen-foot long stems and their unforgiving spines without the proper protective gear. As well as the thorns you can expect high yields of tart blackberries from late-August until late-September. For dense wall coverage plant the blackberry canes about 4 metres (13ft) apart. It may not look pretty, but securing some sheep wire (local co-op) right up along the wall will allow the bramble to elevate itself, and you to tie it in at opportune points.It's stronger and cheaper than trellis, plus it does not need to be treated against the elements as it is galvanised. Any queries or comments on "Security hedges, thorns and burglars", please post below. And Blackthorn. Even more vicious. 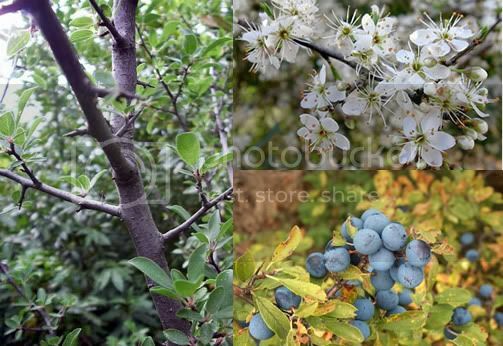 Thicket like growth combined with blackthorns notoriously vicious woody thorns, and the ability to regrow quickly after cutting, makes for an ideal stock/burglar proof hedging material or as a replacement plant for existing hedgerow gaps.